I am making some good progress on the project. Over the past few days I have the drive aligned and the mounting foot bolted in. I threw together the wiring with temporary rudder sensor configuration and was able to successfully complete the Simrad autopilot installation program and drive test. Everything is looking good. Below are some notes for the alignment phase. The idea is to get things aligned so the drive is at the mid-way point when the rudder is perfectly centered. Using a tape measure I hand centered the piston. The Raymarine type 1 has 12″ throw so I set it at 6″ (as close as could). I also unscrewed the drive end a few turns so it could either way for fine tune adjustment. I then centered the rudder and noted that my tape mark on the top spoke of the wheel (helm) was centered as well with the spoke perfectly horizontal. I connected the drive to the tiller arm and set the mounting foot on the base. Did some alignment checks with a square and level to make sure everything looked ok. 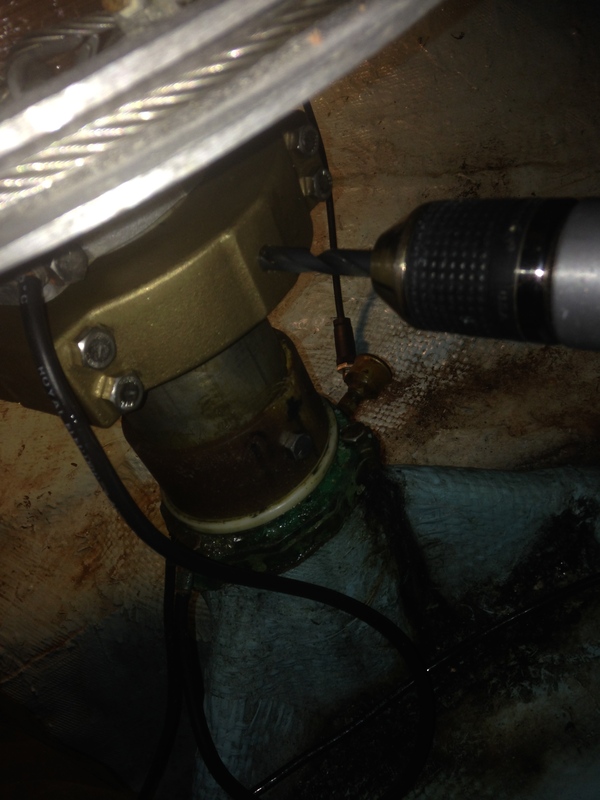 I then drilled two holes through the foot and bolted it down with two SS 3/8 – 16 hex bolts. I then checked center position by turn the wheel gently to the drive stop port and starboard and using a tape measure to check the height of what was the center spoke above the deck with the goal of identical measurements on either side (~23″ for a Sabre 36 with a 36″ destroyer wheel). It required some tweaking and I wound up with a second set of mounting holes as I initially had the drive too far towards the center line. Once I had everything aligned I rigged up the rudder sensor and ran through the calibration and alignment. This will also show any inconsistencies with alignment. The rudder sensor calibration should show consistent angles after setting one side. During the rudder drive test everything sounded nice and smooth. I then finished bolting down the foot with all four bolts. During this phase I also measured for rudder bump stop modification. The stops cannot let the drive exceed it’s limits which is 35 degrees on either side (assuming 10″ radius arm). The Sabre 36 factory setting is around 40+ degrees. I gently pulled the tiller arm to the drive limit and then measured the gap. In measuring I found out the rudder stop bar was a bit misaligned so one side needs a 5/8″ extension and the other a 3/8″. I used drill bits like big feeler gauges to help measure the gap. I will post some pics of the bar and modifications next post. I removed the bar to work on it off the boat in the garage. I had some more time so I started drilling the 3/8″ hole through the rudder shaft and the long side of the tiller arm. I used smaller bits to drill a pilot hole and it only took about 15 minutes to get through back side. I am now working with a 10″ 3/8 bit to get through the far side and progress is slower. I used WD40 as cutting fluid as it is easy to spray into the deep hole with the little straw. 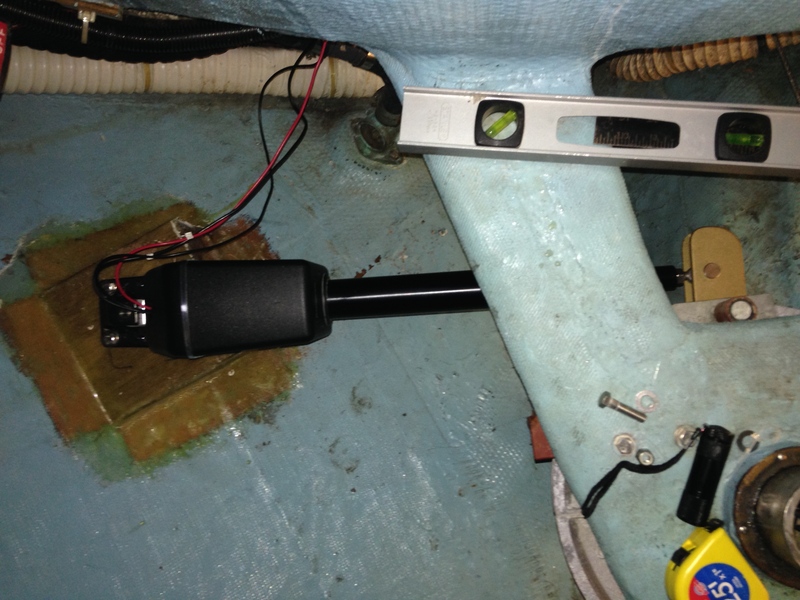 This entry was posted in diy, sailing and tagged autopilot, diy, install, sabre on March 13, 2014 by Boat Nut.